(KFUM DK/Holstebro) – “This award is again a proof that the Scout Movement provides the best leadership education”, said Lars Kolind, Danish business man and member of the Board of the World Scout Foundation, on the occasion of a recent ceremony during which a group of four Scouts from “KFUM-Spejderne i Danmark” received a special award for a project developed during “Spejdernes Lejr 2012”, the Danish National Jamboree held this Summer. “At the beginning, the Danish Nature Agency, a large window manufacturer, a power plant and a large bank had presented four different project teams with a specific problem”, recalls Janus Valsted, from KFUM-Spejderne i Danmark, “and each team was invited to develop an innovative project in reply to a very specific question: How can one develop interaction between government and volunteers so that nature gets better and the number and quality of nature experiences increase?”. This was a real challenge for the teams involved but to the great joy of Thomas, Steffen, Malene and Anne the selection panel finally singled out their project “Volunteers for Nature” and awarded the young adult Scouts with the first prize. The winning project is a website and mobile application inviting and enabling people to give a little of their time to nature preservation projects. “Thomas and his friends were inspired by kickstarter, a website where individuals can make small donations to any project they consider worth supporting”, explains Janus, adding that the selection body was particularly impressed by the leadership abilities and innovativeness demonstrated by the winning team. “It is surely the educational method practised by the Scout Movement, with children and young people learning to take over responsibilities and developing managerial skills very early, which makes the difference. 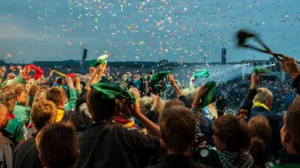 These skills clearly are an asset when the young people enter the business world and labour market”, said Lars Kolind, when he commented on the Scouts’ award winning project. And the adventure for Thomas, Steffen, Malene and Anne is not over yet: the Danish Nature Agency is seriously considering bringing the winning application to the market! More information: KFUM-Spejderne i Danmark on the web and on facebook.